42,000 acre Lake Winnipesaukee home in Alton NH - New! 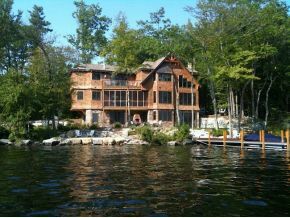 Custom built post and timber-framed home with 166' of shoreline on the lake. This home offers beautiful waterfront living with many amenities. Great views! Over 3 acres of land, 2 deeded lots. Many "Green" features in this high quality home. U-shaped dock, perched beach, professionally landscaped with irrigation system, deck, patios, screened porch, outdoor fireplace. Over 3,800 square feet of living space. 4 bedrooms, 5 1/2 baths. Vaulted great room with fireplace, gourmet kitchen, finished full walkout lower level with fireplace and bar area. Lots of windows and sliding glass doors that bring the outdoors in to take advantage of living on the water. Multi-zoned radiant heat through-out entire home. Insulated Soy wall and roof panels. Southern exposure. Also detached custom 2 car garage with over 500 sq ft ready to be finished as an additional guest suite or possibly home office. (You may also choose for your master suite to be on the first or second floor). Listed By Re/Max Bayside. For additional information on this home call Lady of the Lake Realty at 1-888-737-5550 or e-mail at info@nhlakesrealty.com or visit our website to view similar lake homes in New Hampshire at www.nhlakesproperty.com or www.lakeorskirealestate.com.